It’s this simple: Buy gold on Friday. That’s two days from now. Just do it. You’ll thank us later. To be precise, three months later. On the surface, gold’s price action this month is depressing. It came *this* close to breaking out above $1,300 for the first time since Election Day… only to tumble more than $50. As we write this morning, the bid is $1,242. What’s more, conventional chart analysis says gold is in a precarious spot right now — below its 50-day moving average, and on the verge of breaking beneath its 200-day moving average. But today, we’re telling you to throw conventional chart analysis out the window. You’re about to see gold — and, for that matter, every other asset class — in a whole new way. Before this episode of The 5 is over, you’ll know how to anticipate price moves a full year in advance — using a breakthrough market tool that’s proven accurate 93.5% of the time. Friday is when a new “Kinetic Window” for gold will open. 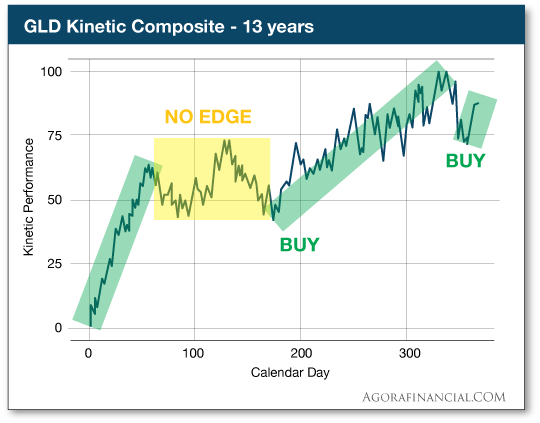 If you’ve been keeping up with The 5 for the last week, you know that Kinetic Windows are a proprietary tool developed by Agora Financial’s Jonas Elmerraji — helping identify the ideal entry and exit points during the year for all manner of stocks, ETFs and other assets. 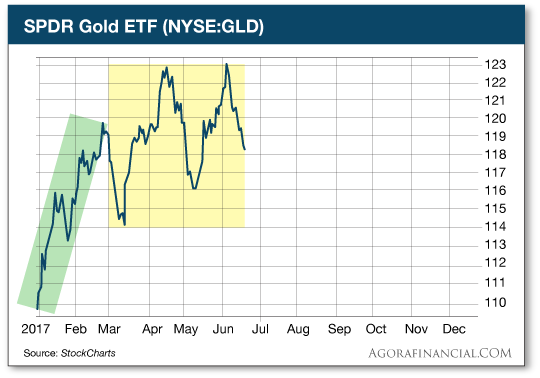 At the start of 2017, to generate the Kinetic Windows for gold, Jonas evaluated every tick of price action in the SPDR Gold ETF (GLD) since it began trading in 2004. Based on that 13-year history he was able to pinpoint when to get in and out of GLD this year. Generally speaking, the story of the last 13 years is one of a big rally at the start of the year… followed by a stretch in which GLD goes nowhere (but with much stomach-churning volatility)… and then another rally as summer begins. If you go back to that first chart, you can divine that GLD’s next Kinetic Window opens soon. And it does. It opens two days from now, on Friday. By observing the Kinetic Windows — in nearly any asset — you can juice the gains you’d get by merely buying and holding. As we’ve mentioned a couple of times, you can use Kinetic Windows on the S&P 500 to increase your returns by an average 24% a year, while sitting on cash for 41% of the year. And so it goes with gold. By using Kinetic Windows on GLD, you boost your performance over merely buying and holding by 28%. And you’re sitting on the sidelines during the choppy periods for fully half the year! But Kinetic Windows are only part of the story Jonas has uncovered after 18 months of dogged research. Hmmm… Look closely and you can discern the presence of a letter “K.” There’s a K lying on its left side signaling a buy… and a K tipped on its right side signaling a sell. K-Signs used in conjunction with Kinetic Windows are so powerful, you could have made money on the S&P 500 during that ugly year of 2008, when the S&P tumbled 38%. In the case of gold the story’s a bit more complex… but every bit as eye-opening. As you might know, gold slid badly from the autumn of 2011 until the end of 2015. The ugliest stretch during that time was 2013 — when gold began the year at $1,690 and ended the year near $1,200. Ouch. GLD generated three Kinetic Windows that year. But — and this is crucial — none of those Kinetic Windows had an accompanying K-Sign. Using Jonas’ method, you’d have stayed out of GLD that entire year… and avoided all that pain. K-Signs combined with Kinetic Windows generate a staggering 93.5% win rate. That’s based on Jonas’ analysis of every stock in the S&P 500 since 2009. “The first time I saw those results,” he says, “I had to rerun the back test twice, because I didn’t believe them.” But sure enough, they checked out. So… Buy gold with confidence on Friday. The Kinetic Window remains open until Friday, Sept. 22. Jonas ran the numbers and says you stand an 83.5% chance of a gain over those three months. If you’re a gold bug with the mindset that gold is for holding long term, Jonas’ K-Signs are an ideal way to get added leverage to the gold price and ride out the volatility. Keep your bullion, but trade in and out of GLD following the K-Signs. Jonas’ proprietary computer algorithm reruns the numbers constantly, identifying buys and sells up to 365 days in advance. And again, the system runs the numbers on literally thousands of publicly traded securities to identify the K-Signs with the most profit potential — as high as 2,705% in a matter of weeks or months. Today we take the wraps off this system — and at the perfect time. Because the system has just generated two red-hot trade recommendations. Don’t miss out: Click here to learn about the K-Sign breakthrough. The major U.S. stock indexes are a mixed bag on this summer solstice of 2017. The Dow and the S&P are losing a bit of ground, but the Nasdaq is in the green. Crude is stabilizing, a barrel of West Texas Intermediate fetching $43.38. For once, the Energy Department’s weekly inventory report didn’t deliver a nasty surprise. The data gods delivered a housing number this morning that surprised to the upside after a run of downside housing shocks earlier this month; existing home sales edged up 1.1% in May. China just took another big step toward standing on the global financial stage as equals with the United States and European Union. MSCI — the outfit that decides on the composition of hundreds of stock indexes around the globe — has decided to include Shanghai-traded “A-shares” in the much-followed MSCI Emerging Markets Index. The move will be effective in June of next year. The change has been years in the making; until now only Hong Kong-traded shares of Chinese companies made the cut. Now fund managers who track the index in their clients’ portfolios will have to buy Shanghai-traded shares. That could mean a $210 billion influx into Shanghai-traded stocks over the next five years. More importantly, the move confers new legitimacy on China. It’s comparable to the International Monetary Fund’s decision to include the yuan along with the dollar and other major currencies in its special drawing right, or SDR — the IMF’s “super currency” traded among governments and central banks. For years, Jim Rickards has been telling us that China is maneuvering to have a “seat at the table” whenever the global monetary system goes kerflooey and the powers that be sit down to decide how they’ll revamp it. MSCI’s change is one more sign that China’s seat is reserved. Meanwhile, it looks as if China is back to its secretive ways when it comes to the central bank’s gold stash. 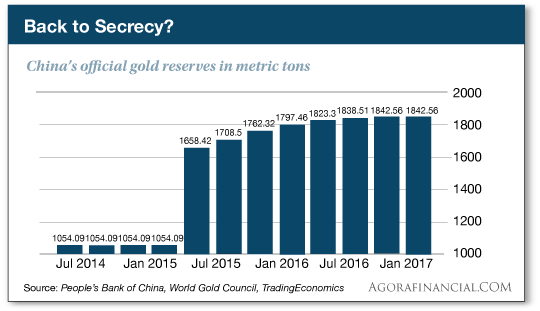 If you’re a longtime reader, you’ll recall that for years China kept the size of its gold reserve close to the vest — updating it only every five years or so. In 2015, it abandoned that practice and started updating the figure every month. Yup. The numbers are being updated each month, but the numbers have stopped changing. 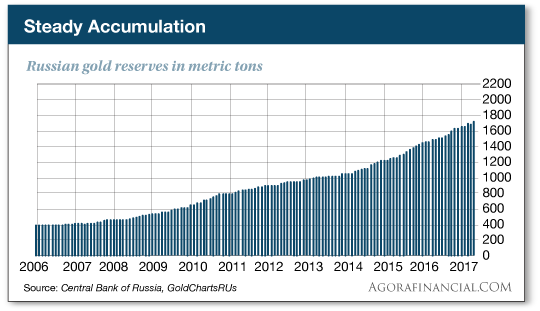 Russia, meanwhile, has no compunctions about telling the world how much gold it’s accumulating. It updates the numbers like clockwork on the 20th of the month. Over the last month the Central Bank of Russia added 21.8 metric tons to its stash. “The price of palladium keeps soaring,” says Louis Basenese. Precious metals aren’t his usual beat, but there’s an angle relevant to the small-cap stocks he follows closely. Palladium is up 30% so far this year, touching a 16-year high. “It’s one of the platinum group metals (PGMs) that automakers use in catalytic converters to reduce harmful emissions,” Louis explains. “No matter how high the price soars, automakers still must comply with environmental regulations. So their costs are climbing. And fast. Louis is following the fortunes of a small company developing a method to use cheaper base metals to do the heavy lifting in a catalytic converter that PGMs do now. “It does so without sacrificing performance. The cost savings are dramatic, too.” Louis recently reiterated his buy in the pages of True Alpha. We’re going to chalk this one up as a too-rare victory in the War on Cash. Workers at a Goodwill in Zanesville, Ohio, came across a startling discovery in a pile of donated clothes — a duffel bag with nearly $100,000 in hundred-dollar bills. The donors — a couple from Lewisville, Ohio, named Dan and Lynette Leckrone — got a tax receipt, so the workers knew how to contact them. But no one picked up the phone. So the workers took the duffel bag to the police — who returned the money to the couple. Yup. The whole thing. All $97,004. No civil asset forfeiture, no “impoundment pending further investigation,” nothing. Dan Leckrone says he and his wife withdrew the money from the bank and put it in the trunk of their car. “We are moving closer to Wheeling and we have been saving to buy a house,” he tells the Zanesville Times Recorder. Hey, all’s well that ends well, and hooray for the Zanesville Police, which passed up an opportunity to outfit their SWAT team with the state of the art. But do the Leckrones have any idea how close they came to having their savings confiscated, never to be seen again? The exact dates of winning trades a year in advance! And we’re revealing it to the general public… today. At the very moment two new K-Sign buy signals are flashing. Follow this link and be among the first to know.